It is a well-known fact that patient healing is enhanced when loved ones can visit or stay with them in the patient’s room. 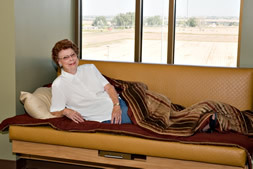 Comfortable seating that easily transforms into a bed mattress and provides closed storage for bedding or personal items allows family to visit comfortably without impacting the caregiver’s work zone. 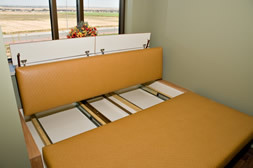 Our patient room convertible seat “slide-a-bed” incorporates these unique features. The heavy-duty ball bearing slides (with a limited lifetime warranty), in conjunction with our patent-pending remote latching hardware (with a five-year limited warranty), provides effortless one-handed transition from seat to bed mattress. Navigating between positions is truly as simple as opening a heavily loaded drawer! The secondary release tool allows free access to the entire cassette area below the cushion for clean up or service. 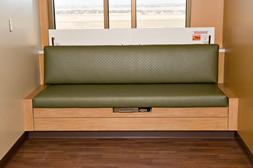 All convertible seat casework is non-porous surfaces to make for effortless sterile environment control. The fully-extended bed position is only 47 inches from the back wall to minimize the impact on the floor space which helps to maintain optimal room for the caregiver staff and their equipment. The back cushion support cabinet provides two enclosed compartment’s for bedding or personal items. The compartments are accessed by fitted spring assisted lids which help prevent finger pinching. The ergonomic dimensions and back-rest angle with quality high-density foam provides a balance for comfortable seating and long-term durability in a commercial environment. The seamless mattress provides a comfortable place of rest for the patients loved one who wants to stay by the patient’s side at all times. 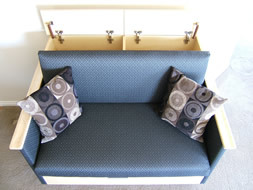 The modular cushion design allows for damaged cushions to be either replaced or repaired quickly. 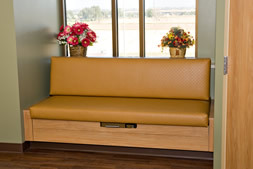 The patient room convertible seats are available in a built-in version that will be centered in the opening, leveled and anchored to the wall studs and trimmed with matching front and top trim. The armchair version can be placed on any open wall and needs to be anchored to wall studs for extension stability during use or service. We can build patient room convertible seats to match specified plastic laminate finishes with the customer’s upholstery material choice. We currently have four different cushion lengths; 62, 67, 72 and 78 inches. We can build any length, however actual finished openings require approximately 5 inch minimum added to the cushion length for the trim out. 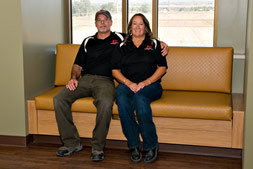 We can provide professional installation or detailed installation instructions. 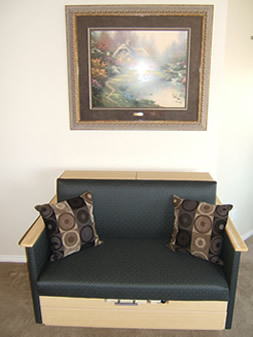 Our convertible seat can be used in many other applications such as college dormitories, motels, cabins, recreational vehicles or any environment requiring convertible seating to sleep area situations.